Here is another card I made during my Dirty Dozen DT term at Splitcoaststampers. For the 10th Anniversary of the Dirty Dozen gallery, we CASEd cards of other Dirty Dozen girls. I CASEd Kim’s card (Kim O’Connell). 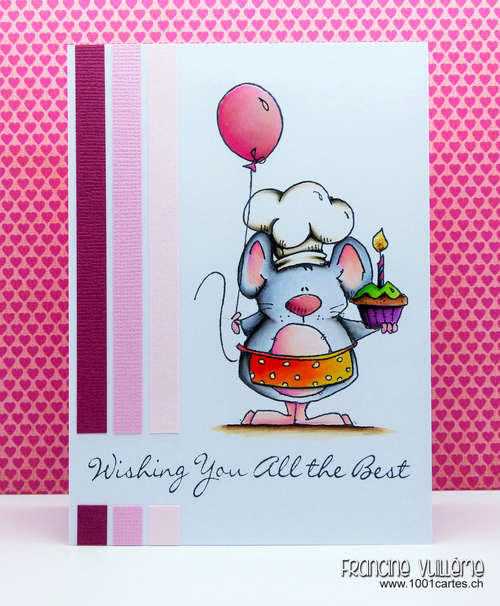 The fun mouse is from Whipper Snapper Designs and the sentiment from LOTV. I colored the cutie with Copic markers and added some Glossy Accents to the balloon and the nose. So so cute Francine. Love love your coloring. Your coloring is so fabulous!! I admire so much the way that you just bring things to life with your artistry!! This card is wonderful - love those 3 stripes down the side. So cool how they break so that you can put the sentiment in between those stripes!! Have a wonderful day!! Oh, sweet Heidi!! I remember this one well and love it!! Your coloring is totally amazing, and I love this sweet little "chef" with his freshly baked cupcake!! Hugs! Ohhh wiedermal eine tolle Karte!! !